I went along with Niamh to the first Get Ready for Work seminar of 2011 the week before last in Dundalk. It was my first time going to one of these seminars and I have to say, for a day at work, I really enjoyed it! The day was focused on talking to students about selling their skills to employers and the different tools they can use to do a little bit of self investigation. Right now I’m at the second of 3 Get Ready for Work seminars we’re running this year (in UL, DIT & NUIG – huge thanks to all the staff in those colleges and all the members of GCI/ Graduate Careers Ireland) and I thought it might be good to explain a little more about the background and the point of these workshops. 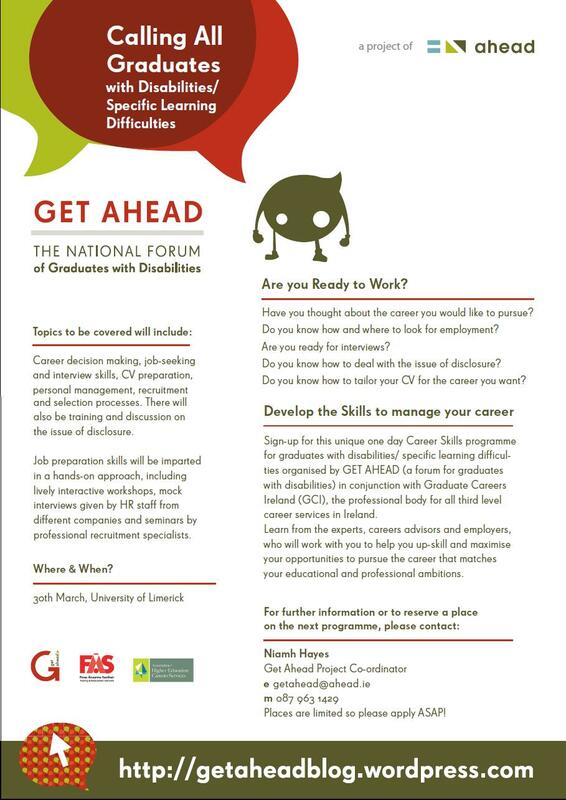 The first Get Ready for Work seminar was run 2 years ago in NCI over 4 days and the point was to try and ensure that students with disabilities were as well prepared as possible for interview and the labour market. It had been and still is our experience that students with disabilities often encounter difficulties in getting work. Not always, but often. The work GET AHEAD does has a couple of strands to it and this is just one element. Right now Get Ready for Work is a 2 day session focussed on giving people extra preparation, and yes, extra advantage. It’s a way of counteracting some of the disadvantages (lack of work experience, bias or prejudice in interview, lack of specific information or support) that disabled people still incur (not the only way, but one. And no, I’m not accepting that disadvantage as a given, rather, I’m trying to challenge it in several different ways and this is one) In short, the better prepared a person is, the better an interview will go, the better an interview goes, the less impact any bias or prejudice can have. Preparation is key. Extra careers support when you’re finished college can be expensive, although there are some opportunities available to access free support – this is another! So what we do is a day of careers skills training – career planning, career management, career development offered by members of the GCI (Graduate Careers Ireland) And on day 2 I talk about all the rights disabled people have in law, in terms of supports, grants, entitlements. I also talk about the issue of disclosure. In the afternoon, there’s a chance to talk to a careers advisor about your CV and to have a mock interview, with an employer and get feedback on your performance on that interview. It’s rare that people spend 2 whole days on their career development, even though work, careers, are a huge part of our lives. I continuously evaluate this program and every bit of feedback counts. Whether it will always be a program that people want or need is debatable but for now, it will continue to be a part of our work. If you’re interested, just get in touch to register!